The mid-March snack-around in California's windmill-iest town is on its sugar-sprinkled way. The mid-March snack-around in California's windmill-iest town is coming up. 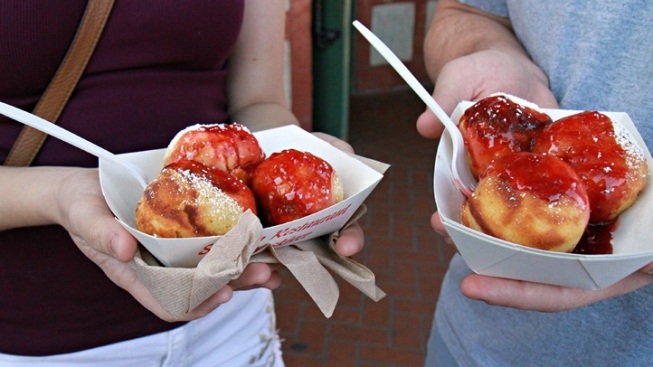 TASTE OF SOLVANG, where æbleskiver is queen of the confectionery choices but other flavorful wonders abound. Those flavorful picks include wines, of course, which is no shocker given Solvang's vineyard-central location. Craft beers, too, will making a sudsy showing, and both vino and brews'll star in the Wine & Beer Walk. Food more your jam? "Dozens" of local eateries will participate, which means you'll try a host of savory meats, creamy cheeses, and desserts that go beyond the æbleskiver should you stroll the Culinary Tasting Trail for "bite-size tastings" that are gratis (and good). THE DATES... for all of this cute-village'd snackery? Mid-March is always the time to watch for this 27-year-along food festival. And in 2019, "Mid-March" means March 13 through 17. As for tickets? You can choose what you'd like to do, and go from there, buying-wise, but if you want the Weekend Pass, it's $115 plus a fee. Find your ticket info here, devoted Solvangers and æbleskiver aficionados.